A thought-provoking article, and a topic that I don’t see debated enough. I do post with caution, as I know things like this have the potential to invite opposing views, but I’m sure that we’re all mature and respectful enough here to debate without causing offence. It helped crystallise some thoughts I’ve been having pretty much all of my life, but especially of late. If we want the Welsh language to thrive and grow, the language and its culture surely has to appeal to everyone - to speak to the identity of all of the people who call Wales home. What I wonder is: are there enough attempts to portray a multicultural, multiracial and multiethnic vision of Welsh-language Wales? Is ‘Welsh-language Wales’, if there is such a thing, by definition white? Should there be more effort to encourage people from different ethnic backgrounds to become part of Welsh-speaking communities? Is it an important part of reaching that goal of a million speakers? No, very much not - I’ve got at least one Welsh-speaking relative who was an evacuee from Liverpool during the war who comes originally from a Caribbean family, to the best of my knowledge. But it’s certainly true that there has in general been less multi-ethnic migration to Welsh-speaking areas, which unfortunately has sometimes lead racists to believe that Welsh-speaking Wales is somewhere worth ‘escaping’ to. Is there an ethnically and culturally diverse future for the Welsh language and for Welsh-speaking communities? Interesting. Wales is so much less ethnically diverse than most areas of Britain, I found it a bit of a shock to the system after growing up in the Midlands! I wonder if in some ways that could actually make it easier for people from ethnic minorities to integrate? (No community to hide in, and a certain amount of novelty value.) There are only a handful of non-white kids at my kids’ school, but they seem extremely well accepted. Personally I’ve never come across anything other than an overtly welcoming attitude. 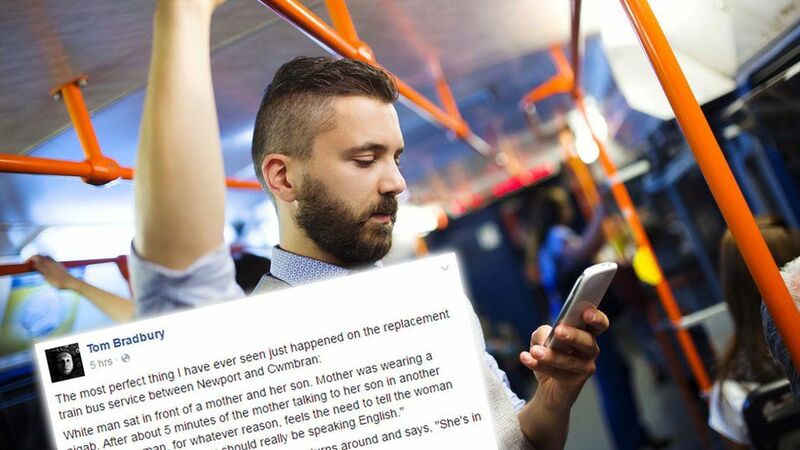 I wonder if that’s other people’s experience too? And notably, some Welsh communities have been exemplary in welcoming refugees - although again the relatively small numbers maybe contributes to making the issue less threatening somehow. Come to think of it, I know quite a large number of non-white immigrants who have learnt or are learning Welsh to a very high level. Maybe Wales is growing up. I’m reminded of the story of the lady in niqab on a bus who was reproached by a fellow traveler for not speaking English when she was in the UK - upon which the gentleman in question was informed that they were in Wales and she was speaking Welsh. 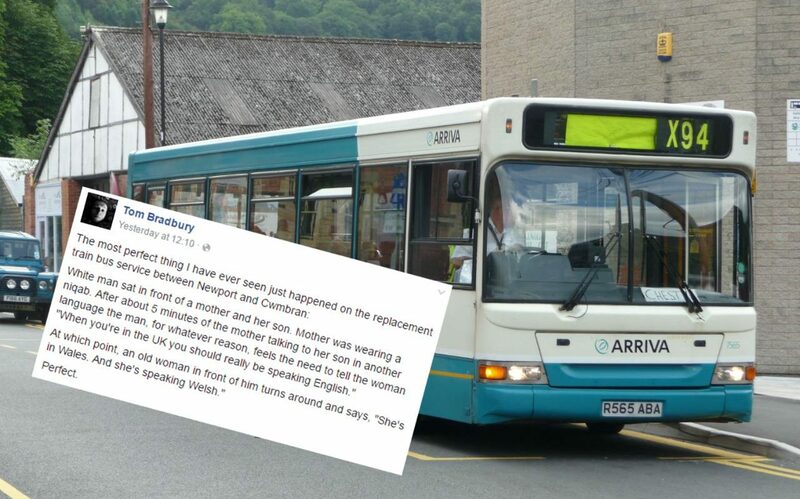 A Muslim woman was apparently told she "should really be speaking English" by a stranger on a bus, when she was actually speaking Welsh. Interesting. Wales is so much less ethnically diverse than most areas of Britain, I found it a bit of a shock to the system after growing up in the Midlands! I think it very much depends which areas of the different areas of Britian you’re in. I’ve worked in the Forest of Dean, Winchester, and the South West (Devon and Dorset). Much less ethnically diverse at the time I was there than Cardiff or Newport! And I once went to a cafe in Evesham where the conversation literally stopped as I walked in the door, like that scene in American Werewolf in London when the two American tourists walk into the local pub. And that was only a few miles outside of Birmingham. Yet one of my favourite anecdotes about living at the end of a tiny lane to nowhere in the middle of rural Mid Wales, is the time I met not just a fellow Sierra Leonean, but someone from my own ethnic group, practically on my doorstep! What you say about some Welsh communities being very welcoming, though, is true. And my post isn’t at all about whether Wales as a whole is welcoming enough, or even diverse enough. What I think has happened though, as often does when we try to ‘preserve’ cultures, is that there is a predominant view of Welsh culture as being the old, white stuff from hundreds and thousands of years ago, and the modern, ethnically diverse Wales (which definitely exists and is growing) isn’t the go-to image when we talk about and celebrate Welsh culture, and Welsh language. The fact is, that both of these things are incorporated into Welsh culture, and just as ‘Britishness’ isn’t a single thing and doesn’t only belong to people from a single ethnic background, neither does ‘Welshness’. It’s interesting, and encouraging, that your experience reflects that. Come to think of it, I know quite a large number of non-white immigrants who have learnt or are learning Welsh to a very high level. Both of these things are fabulous! What I think has happened though, as often does when we try to ‘preserve’ cultures, is that there is a predominant view of Welsh culture as being the old, white stuff from hundreds and thousands of years ago, and the modern, ethnically diverse Wales (which definitely exists and is growing) isn’t the go-to image when we talk about and celebrate Welsh culture, and Welsh language. I think in this context it’s particularly interesting that the ‘Remain’ votes in Wales were effectively the Fro Gymraeg and Cardiff - I remember thinking at the time that the ‘Leave’ vote was a step in the direction of Wales being subsumed by England, and that strengthening the connections between the two different kinds of Wales (rural, Welsh-speaking and urban, multicultural) would be a very important part of building a successful future for our country. I’ll have a go at reading it, and I find the vocab feature on the BBC helpful. I’ve two stepchildren, half Ugandan, living in Cymru, learning Welsh with me and in school. My other children were born in Wales and we’ll all be doing our bit to be part of a multi-lingual, ethnically diverse, positive and dynamic culture within this country. in my experience, there’s a world of difference between ‘integration’ and ‘being of novelty value’. I think I’d better shut up now! Thank you @aran for making and looking after this community!! Ethnic diversity is a consequence of trade and employment and Tiger Bay in Cardiff was a role model and something that people are only now, quite belatedly starting to appreciate. If only it was Welsh speaking as well, but there we are. Today Grangetown in Cardiff is still one of the most ethnically diverse parts of Wales and also the area of Cardiff with the fastest growing welsh speaking population, so who knows. Cardiff and perhaps one day even Newport could be the places where real innovations in Welsh culture, language and identity could flourish in the future. From that will spring the answer to the identity questions and portrayal issues. Vibrant cosmopolitan cities tend be a fusion of lots of subcultures, languages and values. People from vibrant cultures tend to find a way of getting themselves heard and seen. I don’t think you really get multiculturalism when only small numbers of people enter an area, because minority voices and opinions can easily be lost or left unheard. This is compounded in rural Wales because the resident people with energy and ideas, those of working age, are more likely to be leaving the stronger Welsh speaking regions than migrating there. This is a double whammy and not a good recipe for vibrant cultures of any description or the sustainability of what already exists. Personally I believe that strong economies go hand in hand with vibrant, youthful cultures – cultures which are constantly challenging ideas and values and reinventing themselves. From the expression of these cultures comes the identity. Unfortunately the Muslim-on-the-bus story is untrue - and has famously been doing the rounds in various indigenous-minority-language contexts for many years. I heard it almost word-for-word some time back with Breton (if you please!) instead of Welsh…plainly false again. And Latvian some years before that! It’s fake news to try and push a point. This term I’ve decided I’m going to look at Canada in comparison with Wales (chosen mainly because I also read French, a lack of Spanish making either Basque or Catalan not so suitable for me to study!) My fellow students rolled their eyes a little (“Canada? Oh that’s such old hat! And it’s a totally different situation because French is a world language!”) but I still think it’s worth doing, partly (mainly?) because of the question your raise here - Canada has hundreds of indigenous languages that exist alongside English and French, so how is this multi (rather than bi-)lingual society balanced and managed? Perhaps there’s something there that will help us in Wales move forward into a more multilingual/cultural society. I’ll hopefully know a little more about it in a few months’ time! The vocab feature is wonderful. I’ve limped through a number of articles while leaning on it heavily and it’s opened up a previously untapped world of news. Good luck to you and all of your children in your positive exploits. It sounds as though you’re making a great start! I’m sure I saw an article in the Western Mail as the scepticism was taking hold where a Muslim woman came forward and claimed to be the one in the story. I might have dreamt it though. Oh, no! Please don’t think it wasn’t an okay thing to say! It was you wondering something. I wouldn’t have posted the topic in the first place if I didn’t want people to talk about it! And I do get where you’re coming from. Direct and open questioning is usually fine, and it can open dialogue between children that eventually leads to understanding and acceptance. I’m sorry, I picked up on a tiny part of what you said because it struck a chord with me, but I didn’t mean to imply that you’d said anything ‘wrong’. The vocab feature is wonderful. One of the watersheds in my endless journey of self discovery was finding myself pursued by a group of children in my ‘home village’ in Sierra Leone, all pointing and laughing and shouting “Pumoi! Pumoi!” When I asked my cousin what they were saying, he said “It means ‘white person’. They’ve never seen a white person before.” I’m mixed parentage, but up until then I’d never been thought of as ‘white’. Totally freaked me out, but made me realise that identity is fluid and not absolute, but formed in relation to environment and context. …And as you say, much better talked about openly! It’s fake news to try and push a point.